Raise one hand if you love risotto. Raise another hand if you have no patience to actually MAKE traditional risotto. Me too, friend, me too. I have a secret. Well, perhaps it’s not such a secret since I tend to talk about it on our live cooking show pretty often. But, for those of you who don’t already know, I – Brittany Roche – am not a big fan of avocados. Whaaaaaaat?! Ugh, I know. I know. I’m not a fan of plain avocados. Like, dice it up, throw ‘em on a taco? No. 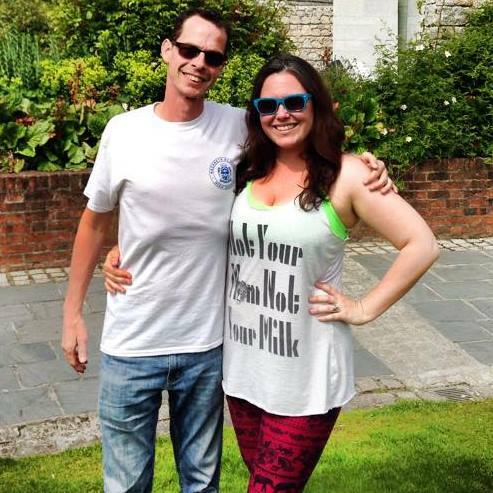 Just, no. They’re all squishy and taste like straight-up leaves. Most people will likely disagree with me on that, but I gotta be true to my gut. And my gut is not a fan of straight up avocados. When I express this to people, the first thing they ask after they recover from the initial shock and urge to slap my smarmy avocado-hating face is what my feelings on guacamole are. Because – surely – any self-respecting person loves a good chips and guac situation, no? The answer to that, myfriends, is: Ehhhh, they’re hit or miss. There needs to be a lot of spices and lime juice involved because if I can taste that leaf taste, I’m outta there. Bring me the tofu queso STAT. 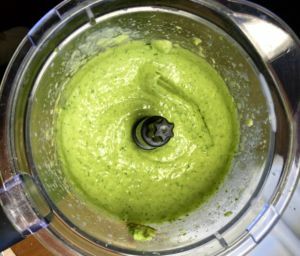 So, that brings me to the one way I DO like to eat avocados, the method that completely transformed my relationship with this food: using them as the base for a creamy dreamy sauce. 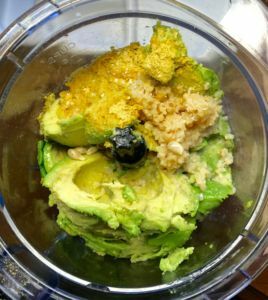 You guys, something freaking MAGICAL happens when you add perfectly ripened avocados to a blender with some plant-based milk, herbs, & spices like fresh garlic, turmeric, nutritional yeast, etc. Ahhhhhhhhh!!!!! THERE it is! There’s my avocado trick. And ever since I learned it, I have never seen avocados the same ever again. Whilst its methods are FAR from traditional, I think you’ll find that familiar cozy, luxurious texture was most certainly NOT spared. 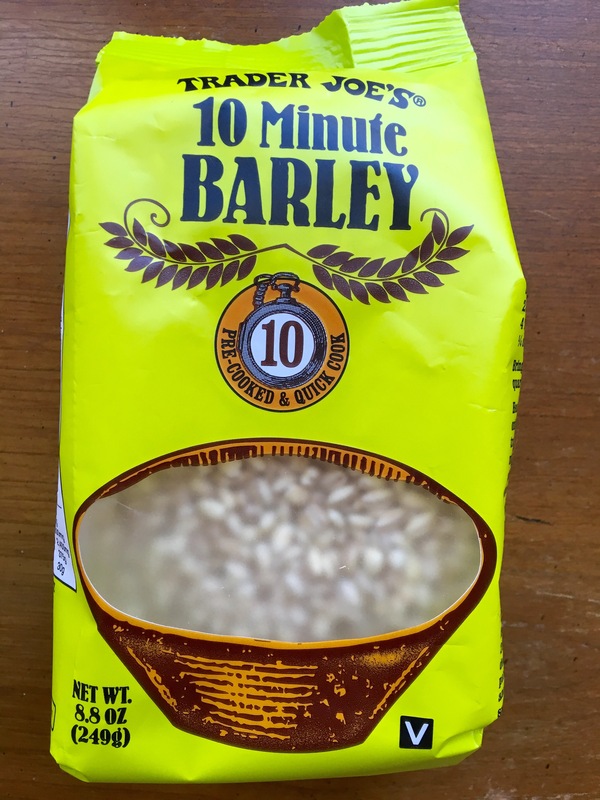 Cook your barley according to the instructions on the package. Whilst the barley is cooking, throw all the sauce ingredients in your food processor and blend until smooth. Feel free to add more coconut milk or water if you feel the sauce is too thick. When the barley is finished cooking, drain it and add it back to the pot. Pour the GORGEOUS sauce over your barley and use a large wooden spoon to combine the two. Heat the risotto on medium-low heat until just heated through. Serve and enjoy immediately! Feel free to sub your favorite unflavored / unsweetened non-dairy milk for the coconut milk if desired. This will create a lighter sauce. Also, to make this recipe oil-free, simply remove the 2 tsp of olive oil. However, for the creamiest results, I would be sure to use coconut milk rather than other non-dairy milks. To bring this together faster (great weeknight option! ), you can pre-cook your barley. You can save le5ftover sauce in an air-tight container for up to 3 days. Because avocados tend to oxidize and turn brown after a while, it may help to add an extra squirt f lemon juice to your leftovers before storing them in the fridge. I really think you’ll enjoy this recipe. If I may offer a suggestion, I say plan a night all to yourself – sometime soon. Get in your comfiest clothes, throw your hair up, get in your kitchen with a glass of wine and a playlist of music you’d be too embarrassed to listen to around anyone else (hi, I’m brittany and I’m addicted to 2000s Emo playlists on Spotify!) and make this dish. Then, hit the couch with a big bowl of this risotto and a new Netflix series. It’s called “me time”. And you deserve it, sister. 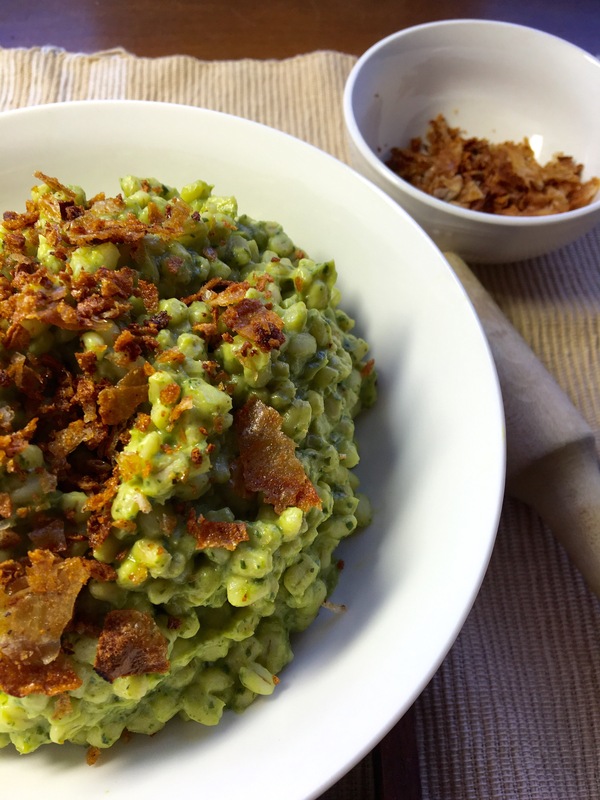 If you’d like more creamy dreamy avocado recipes, check out our Creamy Chickpea Mash with Spinach or Jackfruit Carnitas with Avocado Lime Sauce. Loved this recipe you guys! 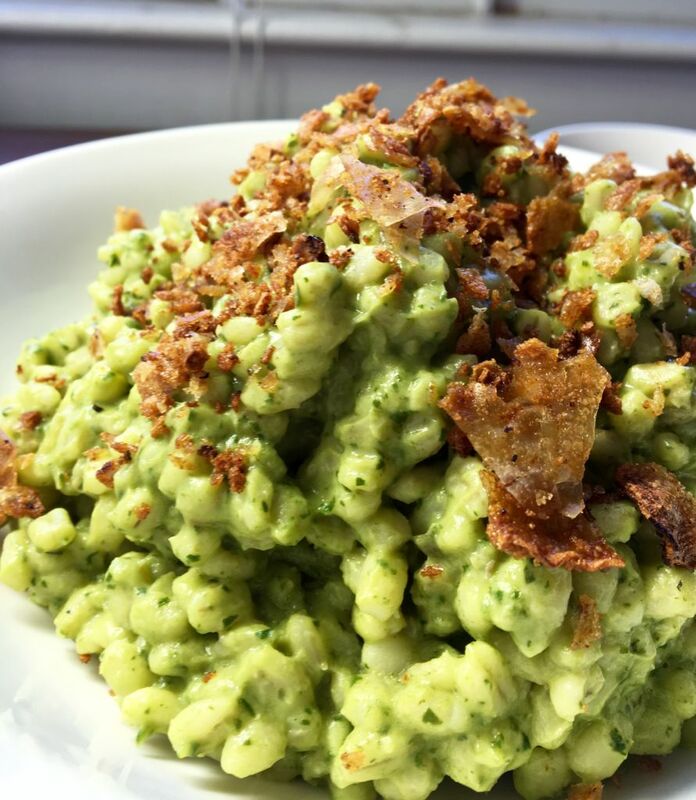 Love the pesto avocado risotto combo!